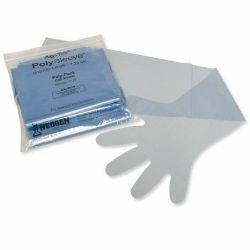 Designed for OB use by veterinarians and technicians, the disposable, polyethylene Ag-Tek® "POLY-SLEEVE"® is a 36" inch shoulder length glove shaped to fit the hand with a minimum of material overlap. 1.25 mil (heavy duty) film thicknesses. Provides excellent strength and sensitivity ratio.